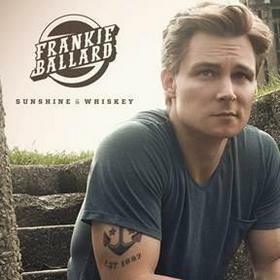 NASHVILLE, TN--(Marketwired - Jan 14, 2014) - Warner Bros. Records guitarist-vocalist Frankie Ballard is releasing his brand new album, Sunshine & Whiskey, February 11 on Warner Bros. Records. The album, produced by Marshall Altman, is available for pre-order on iTunes and at FrankieBallard.com today, and includes his current hit single, "Helluva Life," which is Top 15 and climbing. Ballard has two fan packages available on his site, both containing a CD and digital copy of the album, Sunshine & Whiskey, instant downloads of the "Helluva Life" digital single and music video along with an autographed poster. The "Helluva Life Pack," created especially for his most devoted fans, will be personalized from Ballard himself to each fan. In addition, the package includes access to a private advance listening party online and live chat with Ballard. The Battle Creek, Mich. native's exhilarating live shows and unique blend of edgy, country rock has garnered the attention of superstars Kenny Chesney, Taylor Swift and Bob Seger, who with Ballard has previously toured. He currently has dates scheduled through the spring in support of Sunshine & Whiskey, including a show at Nashville's historic Ryman Auditorium on February 18. Watch for upcoming tour dates to catch Ballard in your area.